P3 DC: An electric actuator designed for load requirements ranging from 800 to 1335 in lbs. The actuator comes standard with two auxiliary switches (Form C), an internal low power heater, a NEMA 4X environmental rating, and in 12 VDC or 24 VDC supply voltages. The P2/3 mechanical connections are ISO5211 compliant. The P2/3 DC Series is available as an on/off or two position model that can also be used in bump/jog applications. Additionally, a proportional control is available to accept 0-5 VDC, 0-10 VDC, 1-5 VDC or 4-20 mA input signals. P3 HV: An electric actuator designed for load requirements ranging from 800 to 1335 in lbs. The actuator comes standard with two auxiliary switches (Form C), an internal low power heater, a NEMA 4X environmental rating, and in 120 VAC or 230 VAC supply voltages. The P2/3 mechanical connections are ISO5211 compliant. The P2/3 Series can be ordered as an on/off or two position model that can also be used in bump/jog applications.120V & 230V models can also be ordered with an advanced internal proportional control card that accepts a wide range of control signals, generates multiple feedback signals, and has look-ahead fault prevention. P3 LV: An electric actuator designed for load requirements ranging from 800 to 1335 in lbs. 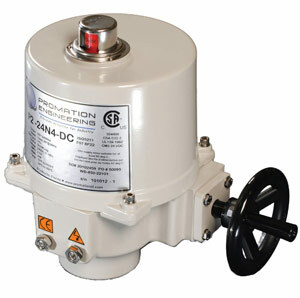 The actuator comes standard with two auxiliary switches (Form C), an internal low power heater, a NEMA 4X environmental rating, and in 12 VAC or 24 VAC supply voltages. The P2/3 mechanical connections are ISO5211 compliant. The P2/3 Series can be ordered as an on/off or two position model that can also be used in bump/jog applications. 24 VAC models can also be ordered with an advanced internal proportional control card that accepts a wide range of control signals, generates multiple feedback signals, and has look-ahead fault prevention.